You’re probably thinking I’m writing this story about 10 years too late. After all who even leaves voicemails anymore? Thanks to email, texting and social media we can contact any business or person we’d like whenever we’d like. But people do still leave voicemails. Dare I say, voicemails are still important. About a year ago this article appeared on Gizmodo. The author asked, “Is there a single good reason to leave a voicemail?” According to her readers there’s more than one. I think Mysterlo80 makes several good points. You’re not always calling from a cell phone, sometimes it is just quicker, and a voicemail is just more professional. That’s why I think businesses of all sizes, no matter if they use TDS’ managedIP Hosted or some other VoIP business solution, should have a professional voicemail greeting. Here are some tips to help you. I know it sounds tedious but it will help eliminate the ums and aahs. Make sure to include your businesses name, hours of operation, web address or any other applicable information. Be sure to include alternative ways of reaching you like a cell phone number or email address in case of an emergency. If you’re going to be out of town include how long you’ll be gone and when the caller can expect a call back. I would suggest keeping your greeting under 20 seconds. I know it may not sound like much but you should be able to say all you need in that time. Again this will help eliminate the ums and aahs. As you become more comfortable with the script it will become easier to add enthusiasm so you don’t sound monotone. Remember, this is your business and your voicemail greeting could be the first contact a potential client or customer has with your organization. This one should be self-explanatory. Turn off the television and all other electronics while recording your greeting. Try to find an area where you will not be interrupted. Since elementary school people have probably been telling you to check your work. It’s the same here. You may think you just recorded the greatest voicemail ever, and who knows maybe you did. But listen to the message once you’re done. You never know what you’ll catch while listening to it that you didn’t catch while recording. Do you have any questions or comments about what you just read? Would you like to shower author Barclay Pollak with praise and adoration? You can contact Barclay on Twitter or G+. You can reach out to TDS on Twitter or Facebook and tell us what you think. Don’t forget the basic info- name, contact info, reason for calling. Give the basic details and keep it short. Thanks John. That is important if you are leaving message. 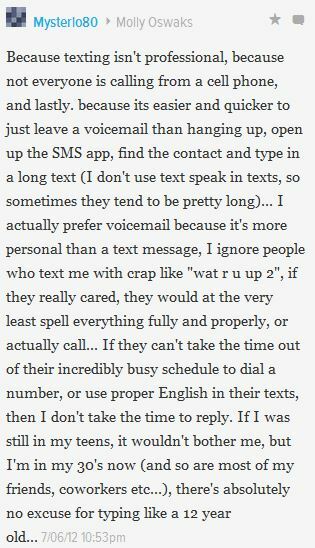 I think you hit the nail on the head with “keep it short.” Nobody wants to listen to a 2-minute voicemail. I have gotten those before and they are painful! I think you’re right. Voicemails that are longer than half a minute are sooo painful.